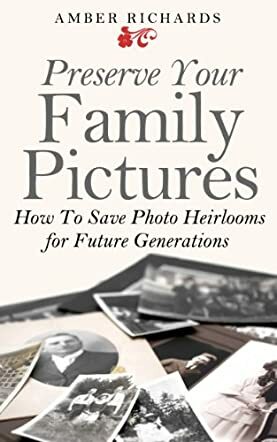 Preserve Your Family Pictures by Amber Richards is an informative e-book on preserving a visual record of the legacy of family history, offering a guide on the practical steps used to ensure family portraits and memories are preserved for future generations. Suggestions are made for effective identification and data organisation, as well as some useful tips to avoid damage to old photographs. Especially useful is the topic of avoiding deterioration of old photos with tips of ideal temperature and humidity and ways to maintain the perfect atmosphere. There are some useful suggestions on how to organise family photographs, be it by size, date or by nuclear family members. Other useful information includes what to do in the case of water damage, which can be a common problem when dealing with old photos that may have been stored inappropriately for many years. There is also helpful information about making digital copies. The author, Amber Richards, has provided some useful ideas in this short e-book. It is helpful to know what to do and not to do when sorting through old family photographs. Should I keep those old negatives or throw them away? I know I have thrown many landscape photos away in the past, thinking they were of no interest. Amber now has me annoyed with myself because they could have provided valuable information of past vacations by my ancestors. This e-book ensures every aspect of preserving those precious memories are taken into account to give a pictorial family history for future generations.